Lashing equipment is used to secure heavy loads and cargo during transportation, by using lashing equipment the load/cargo can be restrained in to postion to prevent any movement which otherwise could cause the load/cargo to fall from the vehicle during transportation. We offer two types of lashing equipment which can be use for securing different types of load, these two types are Chain Load Binders and Web Ratchet straps. Chain Load Binders systems are made up totally of steel components which makes them ideal for securing heavy loads or loads with sharp edges or abrasive surfaces which would normally cause damage to a light duty product. Chain load binder systems can be supplied in different configurations offering the option of ratchet or lever type binders, a range of connecting hooks and chain lengths to your requirements. 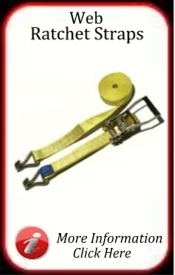 Web Ratchet Straps are made up in two parts, 1 part ratchet end and 1 part adjustable with hook. 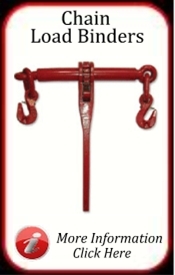 The ratchet end has a fixing hook on a short length of polyester webbing which terminates with a steel ratchet, whilst the adjustable end is made up of a longer length of polyester webbing with a hook one end and this allows the other plain end to be fed through the ratchet to the required length and then tensioned. As these web ratchet strap are primely made up of polyester webbing it makes the product light in weight and very versatile but also makes it venerable to damage from sharp edges and abrasive surfaces. Optional Wear sleeves and edge protector can be used to help protect web ratchet strap from damage. Images are for illiustration purposes only and may not be accurate to the product supplied. Prices and specifications may be subject to change without notice.